Modern kitchen concept using a glossy white finish for the doors and handles in a dark finish for a rare contrast theme! Light shade based kitchen idea that creates a feeling like home. 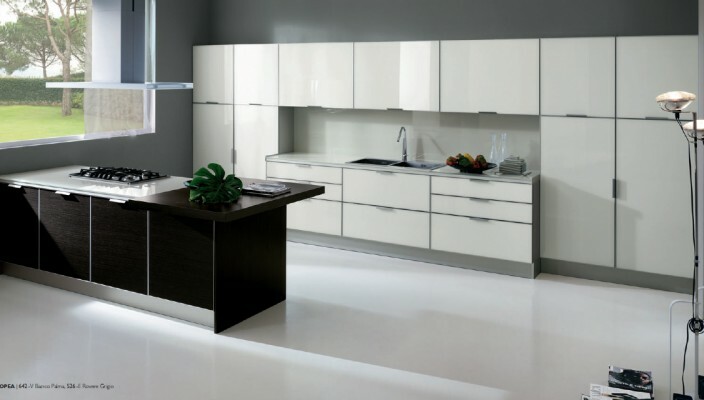 The design features handles that are in a purposefully different shade for a smart contrast with the glossy cabinet doors. Space has been given for adding a worktop with cabinets for the base in a dark finish to bring better dimensions for the light color concept. With most things to be kept under cover, this is a no fuss concept that brings light in the cooking area.